Visit Minted online at Minted.com for interesting and creative custom invitations for weddings or parties, and enjoy a wide selection of stationery, announcements, and more. Minted.com is a new online store offering fresh and modern custom invitations. Minted has gathered a selection of wedding invitations from the most acclaimed independent stationery brands. The selection also includes save the dates, birth announcements and party invitations, personal stationery, holiday cards and more. Check out 58Coupons.com for the latest Minted discounts, Minted coupons and Minted deals from Minted.com. 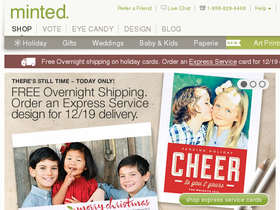 New customers to Minted.com can enjoy a $20 discount on their first purchase. Click here to get shopping. For a limited time only enjoy a 10% savings on holiday cards from Minted. Click link for details. A huge selection of Children's Birthday Party Invitations start at only $1.81 at Minted.com. Clink link to shop. Head on over to Minted.com to save 10% on Wedding Stationery with this coupon code. Shop Minted.com for beautiful wedding invitations starting at $147 for 50. Click link to view now. For a limited time only receive 15% off Baby and Kids' Stationery from Minted.com. Click link to view. Get three free Save the Date card samples from Minted.com when you use this code. Click link to get started. Head on over to Minted to save 15% on Thanksgiving cards with this code. Click link to order.